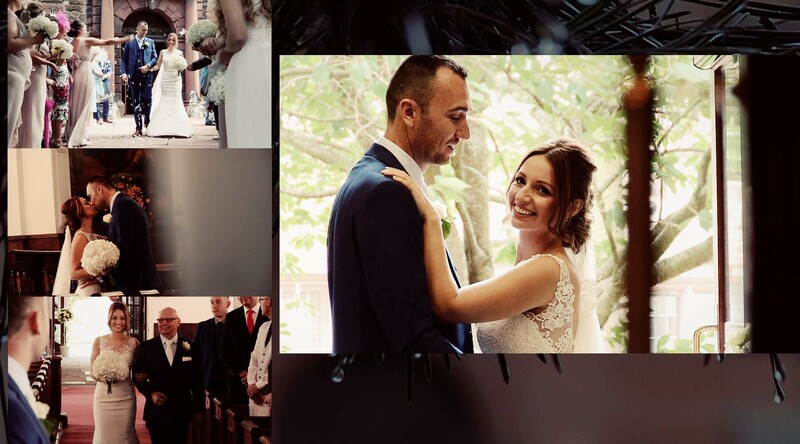 Abi and Daniel were married at St. Andrews Church right in the town centre of Penrith. Penrith is a lovely area for weddings, although not strictly in the Lake District there are so many vantage points in and around the town that afford amazing views of the mountains. I love filming here as there is a real excitement that builds up as the town awaits the arrival of the bride. Gradually people start cottoning on that there is a wedding and begin to hang around. The affect is catching and very often a crowd of a hundred people or more has built up by the time the bride arrives. This day was no exception and it was bustling with eager bystanders when Abi arrived in her smart white VW transporter. It was windy and showery but we were lucky enough to have it dry for all the important bits. After the service we had a few photos around the grounds of the church as it lends itself as a romantic backdrop. Inside it is lined with grand pillars, a huge organ and wonderful tall stain glass window at the head of the church. Rachel Wilson from Kendal was photographing alongside me this day and we managed to capture some stunning footage inside. Stoney Beck Inn was the final destination, a country inn not far from the town. After diving in and out of showers to get some family photos it was nice to film the wedding guests sitting back and relaxing in the lead up to the wedding breakfast. Filming from the side lines, if you get it right, you can catch some fantastic reactions. I am always looking for smiling faces, and this day was full of them.